Don't miss IHOP Free Pancake Day on March 12! Outback Steakhouse, IHOP and Chili's are all having deals this week. You don't need to spend big money to get great food this week! 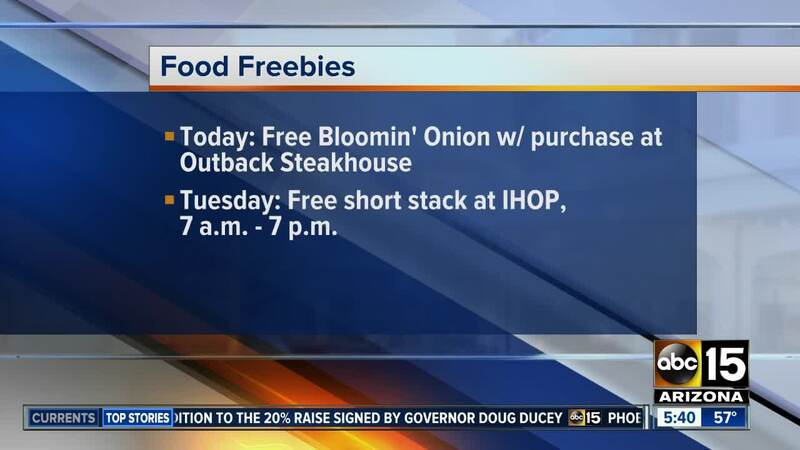 Several restaurants are offering some freebies and deals! Today, March 12, it's IHOP Free Pancake Day. From 7 a.m. to 7 p.m., you'll get a free short stack of buttermilk pancakes. While you're there, guests are encouraged to donate to Phoenix Children's, the Valley's Children's Miracle Network hospital. Click here for all the details. We were told that three million pancakes were given away across the United States last year, with $4 million raised for charity partners. Wednesday, March 13, celebrate the birthday of Chili's! You'll be the one getting the present because their Presidente Margaritas are just $3.13 all day long. Click here for more. Thursday, March 14, is National Pi Day, so we are currently working on a roundup of all the pizza deals you can score! Do you know of any? Email us!